Washington, D.C. is not just our nation's capital  it is also one of the country's premier cities for the performing arts. While On Stage brings the best of Washington's performing arts scene to you on PBS, there's no substitute for a live performance. If you visit, here are some must-see venues. The John F. Kennedy Center for the Performing Arts, located on 17 acres overlooking the Potomac River, is America's living memorial to President Kennedy. It is also the nation's busiest performing arts facility, presenting more than 3,300 performances each year for audiences numbering more than 2 million. It is home to one of the nation's premier orchestras, the National Symphony Orchestra, as well as the Washington Opera, Washington Ballet and the American Film Institute. The Kennedy Center's Millennium Stage offers free live performances daily at 6 p.m., ranging from classical to jazz to folk to pop. Arena Stage has been a major force in the Washington performing arts scene for over half a century. The first regional theater to send a production to Broadway ("The Great White Hope"), Arena Stage has evolved into an internationally renowned institution that produces eight plays a year. Arena Stage actually contains three separate performance spaces: the 514-seat Kreeger Theatre, the 816-seat in-the-round Fichandler Stage, and the Old Vat Room. The name of this flexible-seating space is a play on London's Old Vic, as well as a nod to Arena's original home, the Heurich's Brewery building. Only a block from the US Capitol, the Folger Shakespeare Library houses the world's largest collection of early editions of Shakespeare's plays, as well as more than 275,000 other items including rare Renaissance books, paintings, musical instruments, costumes, and films. But the Folger also offers a full calendar of performances and programs, from poetry readings and theatrical productions to early-music concerts and family activities. Ford's Theatre will forever be associated with the events of April 14, 1865, when President Abraham Lincoln, seated in Box 7, was assassinated by actor John Wilkes Booth. The National Park Service has preserved the site of this tragic event as Ford's Theatre National Historic Site. Park rangers give talks recounting the details of the assassination, and the museum in the lower level of the theatre displays artifacts ranging from the clothes Lincoln wore on the night he was assassinated to Booth's derringer. Across the street, Petersen House, the house where Lincoln died, has been preserved and historically furnished to depict the scene of that night. But Ford's Theatre is also a working theatre, a living tribute to President Abraham Lincoln's love of the performing arts. Since its reopening in 1968, the Ford's Theatre Society has produced nearly two hundred plays, musicals and television specials, including a number of new theatre works. Wolf Trap Farm Park, "America's National Park for the Performing Arts," is located just outside the Capital Beltway in Vienna, Virginia. A gift to the nation from the late Catherine Filene Shouse, the 100-acre park is a partnership between the non-profit Wolf Trap Foundation and the National Park Service. The park's large ampitheatre, the 6,800 seat Filene Center, features seasonal performances ranging from pop, country, folk and blues to orchestra, dance, theater and opera, as well as innovative performance art and multimedia presentations. In cooler months, the adjacent 352-seat Barns of Wolf Trap, constructed of two adjacent 18th century barns, provides a more intimate venue for a variety of performances. 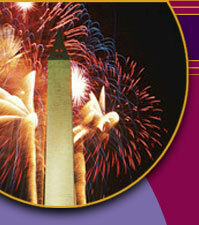 See WETA's Cultural Calendar for more performing arts events in Washington.